The End of Time is actually a short chapter if you think about it since as soon as you head into 1000 A.D. and arrive in Medina Village, your save file changes to The Village of Magic. As you arrive at the other end of the portal you'll come out of a closet and be in a village of monsters who happen to hold a grudge against humans for defeating them in a war 400 years ago. Think of it as the Millennial Fair, but in reverse. Check out the elder's house to the north of town to meet Ozzie VIII, current ruler of the mystic tribe. You'll learn a bit more about the mystics, but make sure you search the kitchen countertop and the bottom left corner of the desk upstairs to pick up both a Speed Tab and a Magic Tab, respectively. Visit the Forest Ruins to the north (it looks like a blue pyramid) and pick up the Mid Ether in the chest. You'll come back here later in the game but for now move on. You'll have to fight a few easy monsters to stay at the inn or buy anything in the market, but you can always restore your health at The End of Time anyway. The market's prices are ridiculous, but they actually have some very good equipment. There's no way you can afford any of the good stuff, but luckily you'll be able to come back later in the game and get them (and at a better price too). Before you waste your money here, wait until you see what Melchior, the only human on this continent, has to offer in his home located Southwest of Medina. Head into the square to find a group of mystics worshiping a statue of Magus, but really, who wouldn't? You'll learn that Magus apparently summoned Lavos and created him to wreak war upon the humans. Head into the Heckran Cave when you want to move on. A lot of the enemies here can only be damaged well by magic. Robo's Laser Spin is the best multi-enemy attack usually available at this point. His Rocket Roll packs even more punch, as well as the dual tech Fire Whirl with Lucca and Crono. Just use magic almost exclusively and stock up on Ethers. The cave is fairly linear, you'll first find an Ether in a chest along the path. Where it branches you should head south to pick up the MagicScarf, then backtrack to get on the main path where you can grab a Mid Ether and another Ether. When you hit the Save Point, you should take advantage of it as usual (use a shelter) because a tough boss is coming up. A bubble attack, which does about 30-40 water damage to one target. Cyclone/Water / Nereid Cyclone: does 60-90 water damage to one target. Go ahead! Try and attack! : This puts Heckran in a defensive stance where he won't attack, but if attacked, will counter-attack with Water wave!!. Yes indeed! / Yah! : slapping attack for around 60-70 physical damage to one target. Water wave!! / Water II! (Water): counter attack that occurs while defending. Hits whole party for 90-100 water damage. Only magic attacks will do any useful amount of damage to Heckran, as you might have guessed considering the previous enemies you just faced. Heckran will occasionally say "Go ahead! Try and attack!" and clench himself up. It's a classic Square boss maneuver, where you're not supposed to attack while he's defending himself or he'll counter-attack with a powerful technique called Water wave!!. 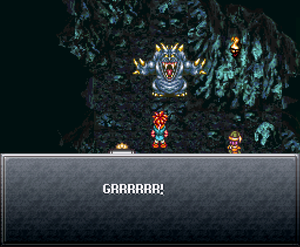 Take this time to use Aura Whirl with Marle and Crono if you have her, or have Robo use Cure Beam on everyone. Resume attacking after the battle text says, "Brief counter-attack break" to tell you when it's safe to barrage him again. Use your most powerful magic, specifically Marle and Lucca's Antipode double tech. When you finally beat him, your party will conclude that Magus brought forth Lavos in the Middle Ages and you need to deal with him. Hop into the whirlpool up north to be transported back near Lucca's house on your own continent in 1000 A.D. Note that you can use the patch of two trees to the right of the bridge labeled "Vortex Pt." to return to Heckran Cave by the same method. Talk to Taban in Lucca's house and you'll get the Taban Vest, which increases Lucca's speed and guards against fire as well as being the best armor so far. Make sure you head to the market, assuming you saved Fritz back in prison. He and his girlfriend Elaine will be very grateful to you for saving him and give you 10x Mid Ethers. He sells the same stuff as Melchior and if you didn't save him in Prison, then his Dad will be there and sell the weaker stuff. 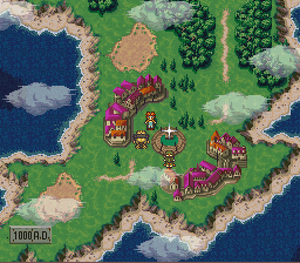 Talk to Crono's mom if you want to introduce everyone to her, and head back to the fair and to the time gate when you're ready to move on. If you haven't already done so you can also go through the time gate in Guardia forest to open it up for future use, it'll be closed off later. When you're ready go through the gate in the Millennial Fair and wind up back at The End Of Time. Take the old Truce Canyon gate to 600 A.D. and you're on to the next chapter. Note at the Fair: Remember NOT to touch the shiny dot on the right teleporter unless you want to face off against Lavos! Unless you're playing the game subsequent times, it's better to have your crew at its highest level possible to take on the monster! If you challenge Lavos in this chapter, which is after you visit Medina and before you visit 600 A.D. again, you'll get The Nu Ending. Same as the last chapter, you'll see a bunch of scenes with a Nu, Kilwala, and a Frog. This page was last edited on 20 April 2019, at 01:28. This page has been accessed 107,997 times.